Enjoy your garden during all Four Seasons of the year! Always dreamed of enjoying your garden all year long? The Outdoor Scene makes your ideal garden living space a reality. With a veranda, you can enjoy your garden all year long. The sophisticated verandas we sell at The Outdoor Scene are based on specific customer needs. Extra thick parts for outstanding stability, proper finish for an attractive appearance and above all, a complete system for unlimited recreation. 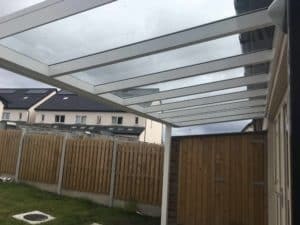 A rainy day becomes a new experience with a veranda, whether you choose a polycarbonate or glass for your veranda roofing. You can enjoy your garden during all four seasons. 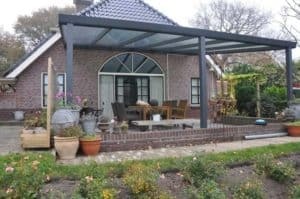 Unlike an awning, our verandas can withstand winds in excess of 117kph and a snow load of 65kg per m2. so you do not have to worry about the weather. 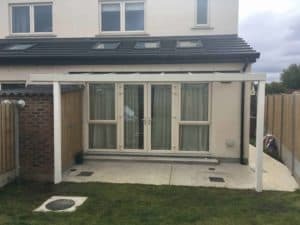 Manufactured in Germany, The Outdoor Scenes Verandas are not only aesthetically enhancing your property, you can be assured that this tried and trusted Veranda system fitted by our professional team with over 30 years experience, will last a lifetime. Extra stability: standard 3 mm thick gutter for extra stability. Perfectly finished front view: our standard 14 cm in height gutters offers that perfectly finished front view for your veranda. Maximum support: the roofing is supported by four sides of rubbers. Attention to details: aluminum cover profiles for roofing and sides presents a uniformed, finished look. Invisible drainage: the drainage is standard integrated in the leg stand. 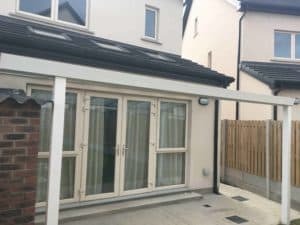 Verandas are available in 35 different standard sizes. The veranda comes as a complete kit (without concrete bases) with a convenient installation DVD and clear instructions. This makes it easy to install your veranda all by yourself. In addition to the standard packages, The Outdoor Scene also provides customized verandas. The verandas are entirely based on specific customer needs. Feel free to share your precise wishes with us using the contact form, email or live help and we will assist you, free of charge. 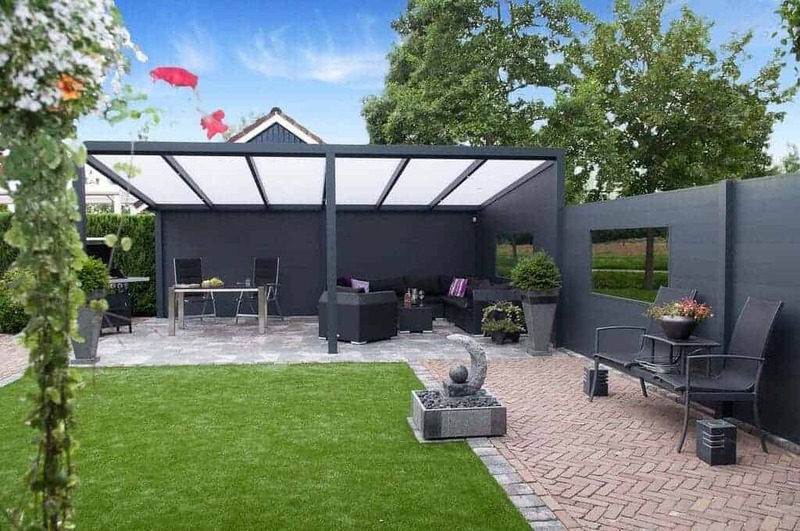 The verandas sold by The Outdoor Scene are made of high quality aluminium. The verandas are coated in three standard colours: RAL9016 (white), RAL 9001 (cream white) and RAL 7016 (anthracite grey with texture). The verandas are manufactured according to strict German building regulations and are therefore strong, secure and robust. Aluminium is very durable, does not discolour and is of low maintenance. The roofing material is a very personal choice. 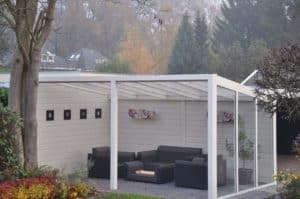 Besides the two polycarbonate roofing types, The Outdoor Scene also offers two heat-resistant versions that not only offers an extra clear version but also lets in more sunlight into the veranda. For those who prefer luxury and transparency, glass roofing is available as well. The Outdoor Scene offers sunlight-reflecting glass as well as the standard safety glass. The setup and composition is totally up to you. 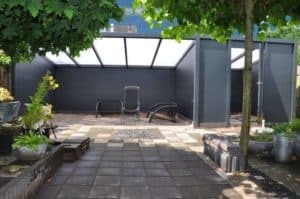 Whether you choose a straight, diagonal or freestanding, as a carport or as a complete garden room. Do you want to expand and decorate your veranda? The Outdoor Scene offers numerous design possibilities for your veranda! Besides the additional options for your veranda walls, The Outdoor Scene also offers lighting and heating.